It’s summer again! That means it’s that time of the year that we try to get off our comfortable sofas and beds at home and decide to work on that summer body. But who are we kidding, we give up on those plans a week into summer and decide to Netflix and chill for three months straight. Although, in the evenings, when the weather is pleasant, I do get the urge to get outside, and breathe some fresh air. What if there was a way to enjoy the breeze outside while watching your favourite TV shows? And that too at a very less cost. 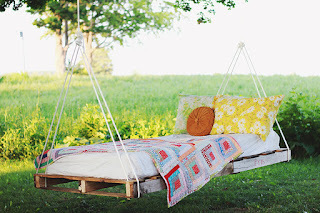 So here we bring before you, 15 ways to revamp your backyard and make it your ultimate hang out place using only upcycled items! We use this type of plastic crates for a lot of things at home. 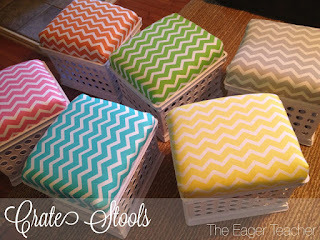 So instead of throwing them out, grab a few and make them into small stools. 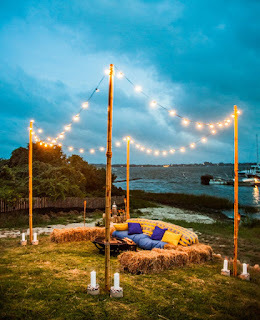 For the seats, plywood with foam could be used, or a cord rope could be wrapped around the top portion, or if you want to make it fancy, get some cushions and stick them over the plywood. 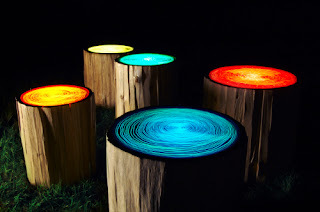 If you ever hit upon tree logs that you don’t need, or stumps that can’t be cut up and used for furniture, you could make these unique glow in the dark stools from them. You can make any paint glow using phosphorescent powder, highlighter, cornstarch and food colouring, just look up a tutorial on that. Chop the tree stump to the required height, smoothen the top surface and apply that paint and you’ve got a glow in the dark stool! All you need for this is a tyre and rope. Wind the rope around the tyre and glue it simultaneously. Instead of a rope, you could use cardboard to cover the tyre and then stick a cushion on top. If you just want to sway by yourself in the breeze outside, make a hanging chair and suspend it from a tree. You’ll need to drill holes in four wooden or steel rods and sew folds at the top and bottom of a large cloth for the seat. 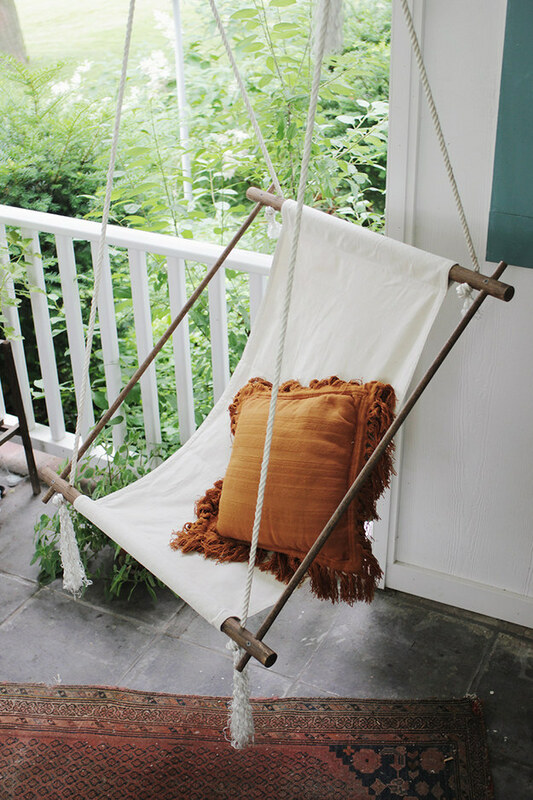 Use ropes to suspend the chair from a strong branch and you’re good to go. 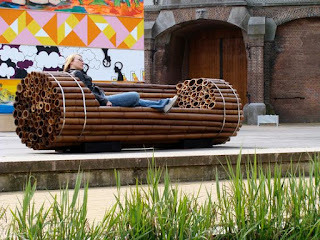 Extra wood lying around and good carpentry skills are all you need to set up this beautiful outdoor wooden seating. Since it goes around the tree, it covers roots above the ground, making it more aesthetic to look at. 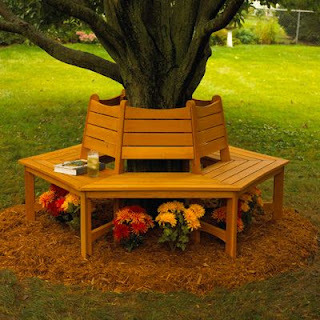 Besides, who doesn’t want to feel fresh, sitting around a tree? Although, make sure the tree you choose doesn’t drop heavy fruits! Some days you dress up, go for a movie and eat at a fancy restaurant. Other days you curl up in front of the TV in your sweats and eat junk. But you could add a theatre style twist to it! 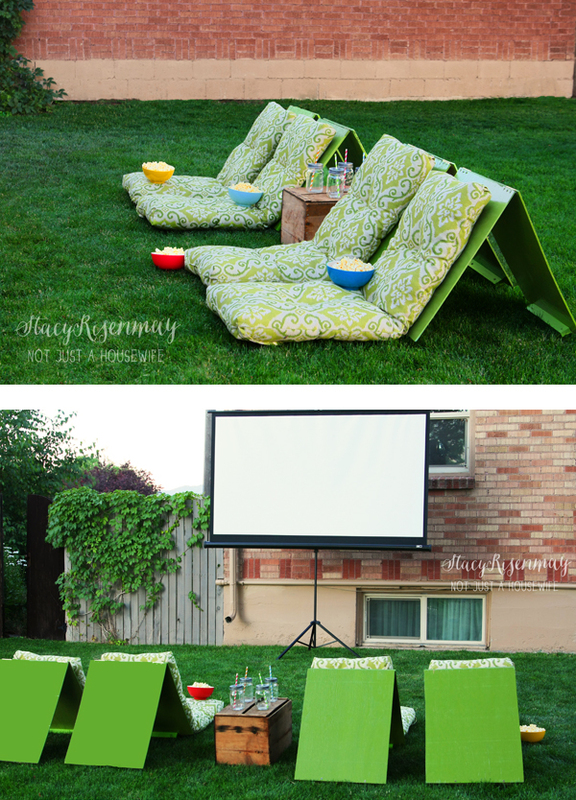 Set up a movie theatre in your backyard with a projector and a screen (You could ‘borrow’ it from work), get some popcorn, coke and make these comfortable seats with just plywood and cushions! Sounds like an amazing outdoor movie night plan! Are you planning to change that old bath tub, and get a new fancier one? Are you worried that the old bath tub will be an eyesore in your backyard shed? 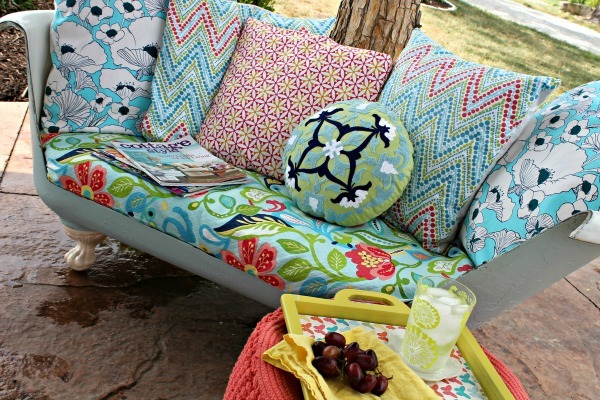 Then convert that bath tub into a sofa, and you’ve got a wonderful outdoor seat. All you need to do is clean the tub, cut the edges with a saw, smoothen them, paint the tub, put a foam board over it, and then pillows and cushions. So comfy! If you have just finished the construction of your house, you’re likely to have some concrete blocks left over. 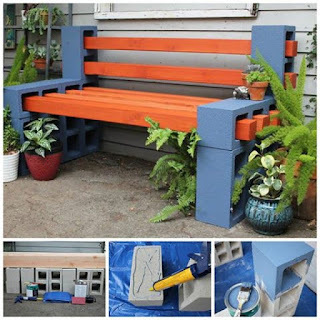 Or if you’ve stored them in your backyard because you didn’t want to dispose them, then you could make this cute and colourful bench with it. An advantage being that doesn’t take much time since the holes are already drilled. 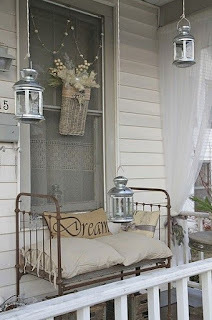 Do you have an old metal bed lying around? Or do you still use one? If it’s the latter and you don’t have an excuse good enough for still using one of those beds, convert them into a chic sofa for your guests! You won’t have to feel sad about dumping it, and you’re recycling too. 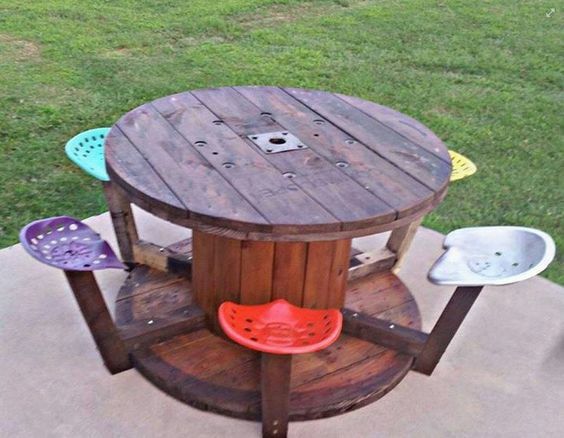 Continuing the list of things that can be upcycled, here’s the next one, a wine barrel. 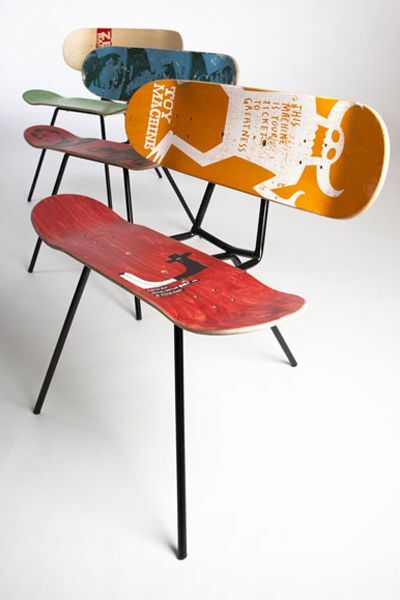 Carve it according to the shape you want, you can make it a stool or a chair. And then stick plywood or a foam board on it followed by cushions. Your cattle won’t be too happy about losing its food, but if you can manage to get hay bales, then you can make this cosy seating area with it. 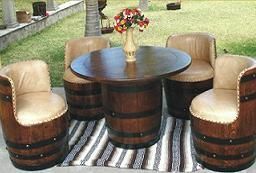 This seems perfect for those evenings when the weather is pleasant and you want to relax with a couple of friends drinking some wine. 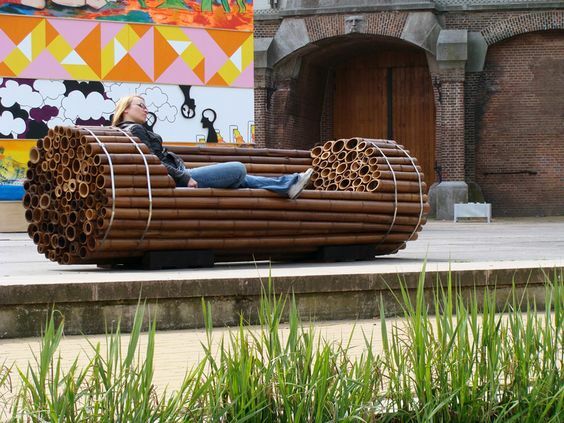 Take a look at this unique bamboo bench. It’s great for a post lunch nap in your backyard listening to the sounds of nature, or away from the noisy kids at home! What do you do when your kid has some friends over and you know they will wreak havoc if they enter your house? You take them to your backyard, make them sit in one of these and give them snacks and a board game to play! At some point in life, you’re going to buy a new bed. So this is for you to keep in mind till then. 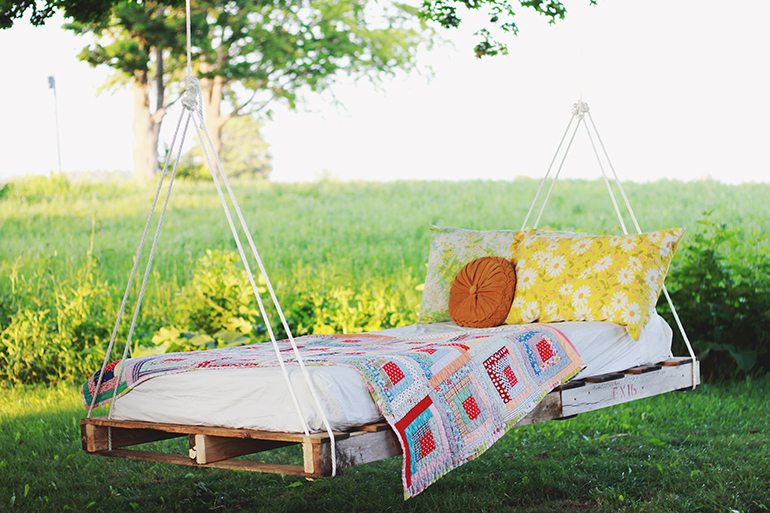 Don’t throw those old pallets away. Upcycle them to make seats, or a huge swing. 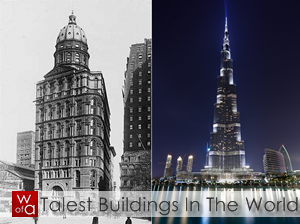 Trust me, all your visitors will thank you for it. If you have kids who used to love their skate boards once upon a time, but now have totally abandoned it, you can make these cool skateboard chairs. So here you go, 15 awesome ways to upcycle the things you don’t use anymore at home to make beautiful outdoor seating options for your backyard. They are all fun to do, require minimal effort and less time, and you’re doing your bit to recycle. So next time, before you dispose off anything as garbage, think of how you can make something pretty out of it. Let the upcycling begin!